This time it consists of a stepped planter made ​​with pallets, where we can plant the plants that we want and even create a small urban garden, think that the design of this planter maximizes the use of its surface area. The idea is to set a pallet perpendicular to another. On the upright one is where we are going to create the higher planters, and at the horizontal one the staggered planters. Read the following explanations and it will be much clearer for you. This is the pallet that we have placed vertically. 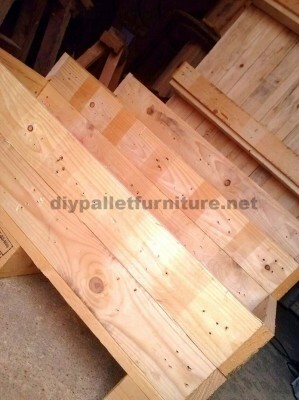 It’s an Europallet and it’s fixed to the horizontal pallet directly using nails. We have also placed some planks under the wooden blocks to create the boxes that you can see, also we have filled the cavities of the pallet with more wooden planks, to make the rear surface completely smooth. Then over the horizontal pallet we have created 3 steps, using more pallet planks obtained from a previously dismantled pallet. At the last picture you can appreciate that this is a very easy to do process. Finally we have painted all the wood with several varnish layers, in order to protect the wood form the moisture, and we have placed some plastic sheets where we are going to put the soil. Now we just have to fill the planters with potting soil and plant our favorite plants or vegetables ! Do you like this DIY pallet urban garden? Do you want to look for more DIY pallet planters?